What we do | Mukti Trust | Sponsor a girl today! Our hostel in Chaparda, a small Indian village near Junagadh, houses 100 girls aged 7 to 19 from all different backgrounds. Muktanand Bapu invites girls in need from villages across Gujarat; others are ‘self-referred’ by their relatives. House-mothers Sandhya, Niru and Meena run the place with enthusiasm, efficiency and love, ensuring all the girls’ needs are met. Many arrive malnourished and lice-ridden, never having known running water or proper beds – so health and hygiene are among their first lessons. 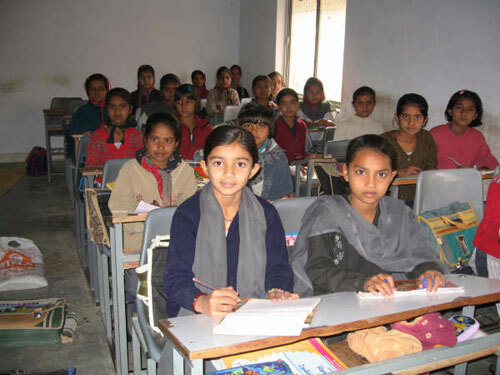 At the neighbouring school, originally for boys only, the girls receive a thorough academic education in maths, science, Gujarati and English. They also learn to expand their creativity, social skills and independence through sport, yoga, music, cookery, arts & crafts, and beauty techniques. We encourage them to be imaginative and enterprising – our art students often sell hand-decorated diyas at markets – and also to form friendships and a sense of community. The nurturing and stimulating environment we offer at Mukti Trust gives these previously vulnerable girls – who could otherwise only earn minimal wages as farm labourers or cleaners – skills, confidence and independence. They become well-rounded, self-reliant and highly employable, with many going on to study at degree level and find meaningful, lucrative jobs. They are always keen to show others from their villages what is possible, and that being female is no barrier to success.